The Canon Pixma MP270 printer is literally a multitasker. This ink-jet printer is loaded with features. If you are looking for a device that can print, scan, and copy; and produce crisp texts prints and professional quality photos; then you have got a good deal! This printer can perform all of the above functions and it falls into your budget too. Canon Pixma MP270 ink cartridges for replacements can be easily bought online. 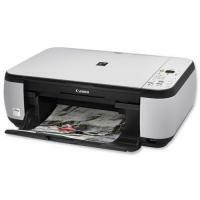 Canon Pixma MP270 is a neat looking machine that has been styled in black and light grey colour. Contact Image Sensor (CIS) scanning head does not increase the height of the printer. In all this, printer weighs about 5.60 kgs. The height is 6.1 inches, width is 17.8 inches and depth is 13.2 inches. The printer is designed ergonomically adding a slight curve to the sides of the main body to facilitate easy and steady handling. The printer is packed up with useful features. To begin with, it supports Mac and Windows operating systems. Softwares like Canon Easy-PhotoPrint EX, Canon Easy-WebPrint, Canon MP Navigator EX etc are made available on purchase of the printer. This inkjet printer works on Canon FINE (Full-Lithography Inkjet Nozzle Engineering) Technology. The printing resolution is for mono is up to 600 X 600 dpi and for colour is up to 4800 X 1200 dpi. The Canon ChromaLife 100+ ink that you get with the machine gives good quality prints. Though once you have consumed the inks, you can purchase the Compatible Canon Pixma MP270 ink cartridges online that offer great quality prints similar to the original ones and are available at much lower prices. The input tray of the printer is made to hold up to 100 sheets and you can use A4 and Letter A size papers for prints. The CIS scan element facilitates a scanning resolution of 1200 X 2400 dpi. The copier lets you copy up to 20 pages. It includes the BorderFree (fit to page) feature. The Canon Pixma MP270 prints at a speed of 4.8 ppm for colour and 8.4 ppm for text documents. The printer gives you the complete value of your money. Though the print commands on LED can be confusing to understand without the manual, the other features that it provides are great. The printer will work good in an office as well as a home setup. How to replace the Canon Pixma MP270 printer ink cartridges with the new ones? Q. How is the Canon Pixma MP270 printer featured as multi-tasking, yet low in cost? A. The features like print, scan, copy, crisp text prints and professional quality photos make this device multitasking in nature. Including all the features, the printer is low in cost. Also, the replacement for its Canon Pixma MP270 ink cartridges can be easily bought online. This all make this printer a popular choice among users. Q. Can you tell me the replacement for Canon Pixma MP270 ink cartridges and where can I purchase them on this site? Q. What are the operating systems, the Canon Pixma MP270 printer is compatible with and the softwares the printer comes with? A. This printer supports Mac and Windows operating systems & the software like Canon Easy-PhotoPrint EX, Canon Easy-WebPrint, Canon MP Navigator EX etc are made available on the purchase of the printer. Q. Although the printer has average print speed, how can I use this printer for my profession of printing photos? A. The printer is the perfect choice for your profession as the printer can print, scan, copy and produce professional quality photos. With such features, the printer is also low in cost and include inclusive softwares and support direct printing connection. Q. What are the missing features of this printer? A. The printer does not contain LCD screen and wireless connection technology. Q. What is the maximum print resolution of Canon Pixma MP270 printer for both mono and colour prints? A. The printing resolution is upto 600 x 600 dpi for mono and 4800 x 1200 dpi for colour prints. A. The printer prints at a speed of 4.8 ppm for colour and 8.4 ppm for text documents. Q. I think didn’t get the installation of my Canon Pixma MP270 ink cartridges right. What should I do now? A. If your cartridge is not installed properly, you need to first remove the ink cartridges from the printer and install it again. They should snap into place steadily in order to be installed properly, after which you need to take a print. Also, you need to turn off the printer and then switch it on again to reset the error message, which should sort the issue. Q. I’ve been using the Canon Pixma MP270 printer for quite a while. I use compatible Canon Pixma MP270 ink cartridges but sometimes when I install them, I get the message that the ink level is low. Why does that happen and what should I do when it occurs? Please help. A. Low ink level indication is nothing but a result of using compatible ink cartridges, which is not a serious printer issue. You can simply bypass this indication for which you need to press and hold the STOP/RESET button on the machine for five seconds and then leave it. Your printer will begin printing properly after this and you won’t have to worry about anything after this. Q. Is it necessary to store partly used ink cartridges only in a cool area? Will my Canon Pixma MP270 ink cartridges be damaged if they happen to encounter higher temperature levels? A. You need to ensure that your ink cartridges are always stored in a cool and ventilated place and they are never exposed to temperature which is above the average room temperature. If the ink cartridges are in higher temperature environments, there may be bubbling and foaming in the liquid. In addition to that, the heated ink’s expansion and succeeding contraction when cooled can damage the ink cartridge, which will render it useless. Q. What to do when i got streaks or uneven printing on the trailing edge of the paper? A. While printing a picture, streaks or uneven printing may appear on its trailing edge (inside the red frame). This problem is generally caused by printing outside the recommended print area which may be corrected by using the combination below. Q. What other functions should i perform when my printer goes out of ink? A. It is possible to use other functions of your printer when an 'out of ink’ error message is displayed on your screen. To do this, it is recommended for you to first clear the error message by pressing and holding the machine’s [Resume/Cancel] button for at least 5 seconds (this setting may vary depending on your model, so please refer to your printer user manual for detailed instructions). Once the error has been cleared, other functions like scanning can be performed. Please be aware that if printing is attempted after clearing the error, the quality of prints cannot be guaranteed. Having cleared the out of ink error message, the remaining ink level will be unknown and damage may occur within the printhead if the ink runs dry. We recommend replacing the Canon Pixma MP270 ink cartridges as soon as possible to avoid this from happening. Q. The ink cartridges i got with my printer comes to end of their life and i have to buy the new one’s. Does the cartridges you offer give good results? A. The Canon Pixma MP270 ink cartridges we offer contain specially formulated inks for great document and photo quality. One is a Black cartridge for laser-quality text and other one is a multi-colour cartridge for pictures. Both offers 12ml ink volume and are so easy to use and replace. Q. When replacing the cartridges for the first time what recommendations do i need to follow? A. When ink runs out while printing is in progress, the error code will appear on the LED. The Alarm lamp will light up and the Ink lamp will start flashing. This means that the Canon Pixma MP270 ink cartridge has run out of ink and need replacement. Make sure that the power is turned on, and then open the paper output tray. Lift the scanning unit (Cover), and then hold it open with the scanning unit support. Remove the empty Canon Pixma MP270 ink cartridges. Prepare the new FINE Cartridge. Take the new cartridge out of its package and remove the orange protective tape gently from it. Go for installing the FINE Cartridge. Put a brand new cartridge in the FINE cartridge holder. The colour Canon Pixma MP270 ink cartridges should be installed into the left slot and the Black cartridge should be in the right slot. Gently close the ink cartridge locking cover to lock the FINE Cartridge into their place. Push down the ink cartridge locking cover until it clicks, this will confirm that the locking cover is closed correctly. A. No, you will not get any difference when you print through the compatible Canon Pixma MP270 ink cartridges as we provide the best to suit your printer needs. All our cartridges are tested to the highest quality standards in order to provide you the same quality printouts as you get while using the equivalent original cartridges.